Netting is proovable in middle Europe since the late neolithic (for example in findings from piledwellings at Bodensee lake), in this time mainly for the making of fishing nets and transport-nets. The technique itself does not change over thousands of years and until today has remained a living craft. 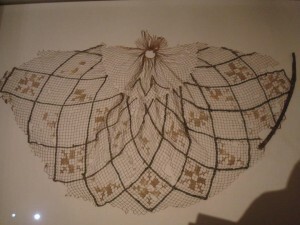 In medieval times, hairnets in netting technique (prior: sprang) become increasingly popular, mainly because of the structure of the nets which allows different kinds of embellishments. Especially common was wearing of hairnets with women as well as men. The net is made with a special kind of needle which is split on both ends, similar to a weaving shuttle. The size of the wholes is determined by a wooden or bone spacer, over which the loops are worked to achieve a regular width. During the work, loops can be added or decreased which is very common in netting round forms.